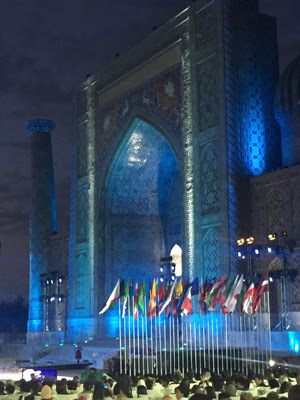 For some years, visiting Samarkand's world music festival - Sharq Taronalari - has been on my bucket list. This year I finally made it. 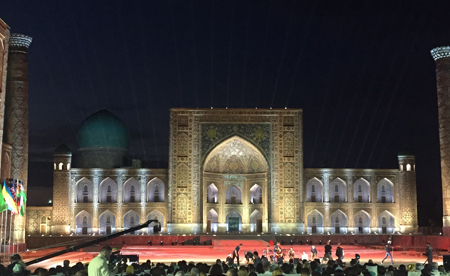 Held every two years at the end of August, Samarkand's Registan - called "the noblest square in the world" by Lord Curzon in the 19th century - morphs into a musical melting pot, resonating to sounds, song and dance from around the globe. 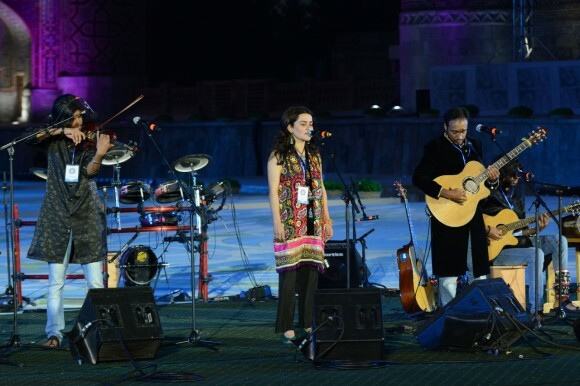 The festival, an initiative of Uzbek President Islam Karimov, and under the patronage of UNESCO, aims to foster international cooperation by building close contact between artists and musicians from different countries. 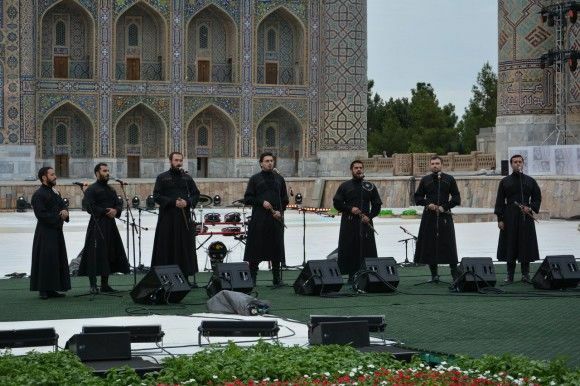 This year, musicians from 66 countries participated in the 10th staging of the event. Groups came from Africa, New Zealand, Central Asia, South East Asia, Latin America, South Asia, the Caucasus, the Middle East and Europe. Truly, Samarkand was once again the crossroad of civilizations. The late summer weather was perfect for performances, most of which started around 5:00 p.m. Some evenings the music continued until after 11:00 p.m. As a bonus, the Registan's fabulous new sound and light show was screened. The majestic buildings came alive as the history of this extraordinary city unfurled. I particularly liked the Georgian group Didgori, whose goal is to revive ancient, Georgian folk traditions. As well as classical, traditional music there were interesting fusions sounds such as the Pakistani group Surur and a combination entry from Spain and Indonesia. The Uzbek singers and musicians, in dazzling costumes, were sensational. An 8-member international jury awarded China's Jiangsu Women's Orchestra the Grand Prix and Japan's Shamisen won 1st prize. Poland and Estonia shared 2nd prize and Costa Rica won 3rd prize. It was clear talking to the musicians that to perform in such a venue was like a fairy tale. And of course the festival provided many opportunities for musicians to play together, experiment and exchange musical experiences. 1. Book your accommodation at least 6 months in advance. 2. If you plan to travel by the super fast Afrosiab train, also book your tickets in advance. The train, which takes just 2 hours and 10 minutes to/from Tashkent, was fully booked for a week after the festival ended. 3. You must have a ticket to gain entry to the festival. This year tickets were issued free of charge to tourists at the Sharq Taronalari office at the Afrosiabs Hotel. You must present your passport when applying for a ticket and again when you enter the festival. 4. Tickets to the opening and closing ceremonies are issued by Uzbek Tourism to specially-invited guests, diplomats etc. It is very difficult for tourists to obtain those tickets. 5. There are no food or drink stalls in the festival grounds - make sure to bring water and snacks. 6. Because of security and festival preparations, the Registan is closed to visitors during the day for about a week leading up to the festival. Bear this in mind if you are planning a trip to Samarkand in that week - there were many disappointed tourists. Also keep in mind that during the festival many roads are closed.